being MVP: Learning Resources: New Sprouts® Ring It Up Cash Register & Giveaway! 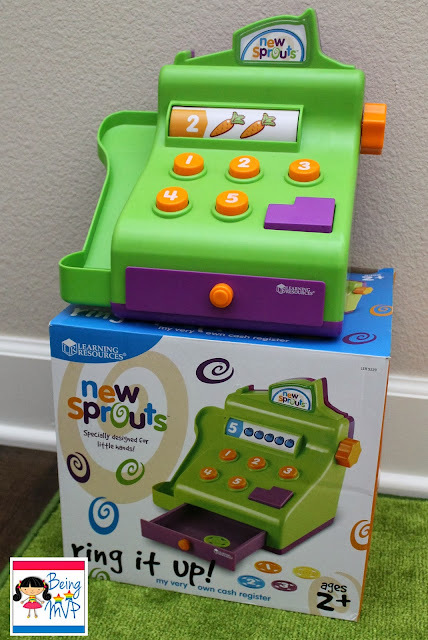 Learning Resources: New Sprouts® Ring It Up Cash Register & Giveaway! When I took Kenzie along to buy a car several weeks ago, she saw a little cash register in the waiting area and had a blast playing with it even though it was probably ridden with germs and had a drawer that wouldn't pry open without super hero strength. 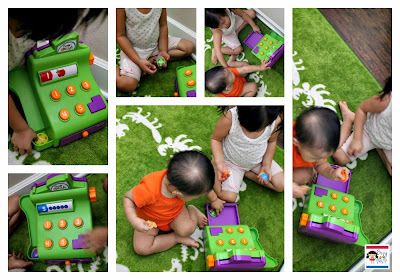 So when the New Sprouts® Ring It Up Cash Register arrived for review from Learning Resources, she couldn't get it out of the box fast enough. 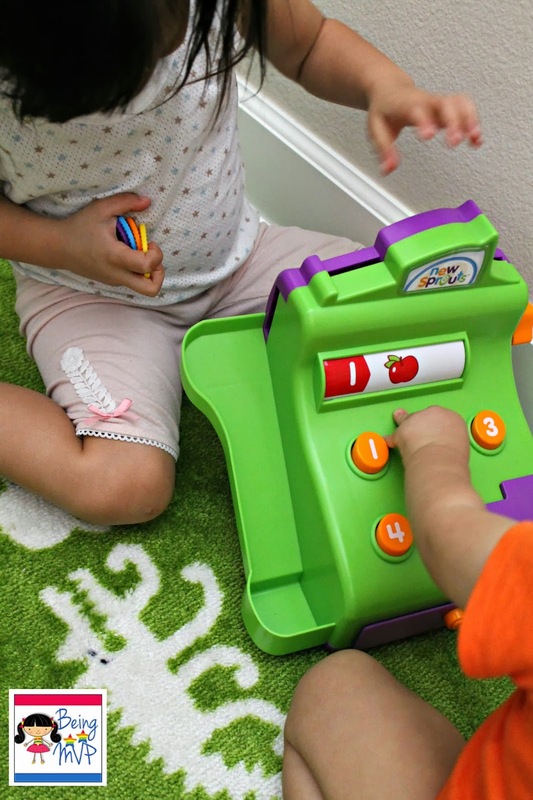 This play cash register is just the perfect size for toddlers and is bright and fun just like the other New Sprouts® products from Learning Resources. This is a basic register that features large orange numbered buttons that, when pushed, make the screen spin and reveal the corresponding number of fruit. Although Kenzie knows her numbers, this is a great learning tool for Mason. The fun factor comes in with the coin money. There are 5 numbered coins that can be inserted into the register from the top in one of two slots. The slot to the right deposits the coins directly into the register drawer while the slot on the left brings the coins down the shoot just like change. If your coin(s) gets stuck inside, don't fret because you can just turn the dial on the right side and it will drop down. Both Kenzie and Mason enjoy placing the coins in the slots, then pressing the large purple button to open the drawer and finding them inside. This cash register is great for imaginative play because Kenzie always asks us to buy things and give her money to put into the register. The toy itself is sturdy and well made. It has withstood several drops and remains intact. Yes the kiddos fight over the coins one day and the next day they share. Another great product from Learning Resources. Buy It: You can purchase the New Sprouts® Ring It Up Cash Register for $29.14. New Sprouts® Ring It Up Cash Register! The Math Mat Challenge™ Game looks cool! I want the Gears Gears Gears building set. Are both of the Pin This entries supposed to be for Kim Chee Fries, because they are both the same pin. Oops sorry bout that, I needed to refresh and see the one is Cajun Shriimp now! I like the Easi-Speak™ USB Recorder Set of 5 with Charging Hub. My grandsons would also love the Gears! Gears! Gears!® Lights & Action Building Set. the human body flip chart! Id like the New Sprouts Breakfast Lunch & Dinner baskets! The New Sprouts® Dinner Basket is something that looks fun but teaches them different meats to eat at dinner. I love the Word Whiz Electronic Flash Card™ for my granddaugher. My kids would also love the Gears! Gears! Gears! Lights & Action Building Set! Creative Color Cubes™ Activity Set! Math Mat For My Son! I like the Gears! Gears! Gears!® Lights & Action Building Set. Thanks so much for the fantastic giveaway! We want to try the Light Writer! Very fun! I would like to have the Learning Resources New Sprouts Lunch Basket . I want the Ten Frame Treasures. I would love the Lowercase Alphabet Stamps. Id like to have the sneaky snack squirrel game and the outdoor thermometer. i like the Gears Gears building set too. I'd love the Design & Drill® Power Tool Workshop for my son as well! I like the Riddle Moo This™ - A Silly Riddle Word Game. Sight words bingo! Thanks for the chance! I would like the New Sprouts® Munch It! My very own play food for my son. He loves play food. I also like the Giant Magnetic Animal Cell Set. I'd love to have the New Sprouts® Fix it! My very own tool set for my son. I would love to get the Extra Play Money to help my kids learn how to count back change. That way if they ever go to work as a cashier then they can count back change correctly. The Jumbo Foam Dominoes would be nice too. I like the Jumbo Endangered Animals. I like the New Sprouts Deluxe Market Set.